← A wild Adventure Down Under. While not every story was my thing, I still enjoyed them all. Each one was different from the last but contained what I felt was a full story. What I mean by this is that none of the stories were so short that they felt incomplete. I think this book would be an excellent choice for readers of all ages who like quick and fun stories. This would make a good read for parents who like to read stories with their children before bedtime or anytime when a quick read works best. This is not the first book I have read by this author. I have read and enjoyed several other of her works. At this time my favorite one is Cheetaka Queen of Giants, a book I previously reviewed on my blog, but I would easily recommend any of her books. One particular thing I like about this author is what she charges for her books. All of them are $5.00 or under making them easily affordable. She has one permanently free book called, Daksha the Medicine Girl as well as several children’s books for $0.99. 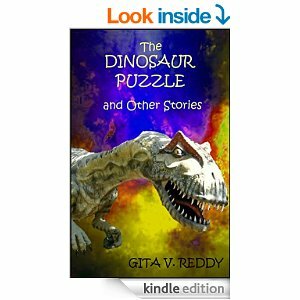 This entry was posted in Book Reviews and tagged adventure, Book Reviews, children's books, childrens fiction, Gita V. Reddy, Reccomendations, The Dinosaur Puzzle. Bookmark the permalink.